up to 1.3 Gb/s for new 802.11ac routers w/Beamforming technology. have a range of more than 300 feet and wireless signal can travel through walls and other obstacles..
do not require expensive Cat5/Cat6 cabling or Ethernet switches. And hubs. it does not require any structural changes to accommodate the cabling necessary in wired networks. Additionally, wireless devices such as printers and media servers can easily be moved from one place to another location without changes to the home network configuration. Create administrative and user names and passwords. Select the optimal Wi-Fi channels and speeds. Install Wi-Fi Security facilities – Including unique SSID, WPA2 security settings, WPA passphrase, and MAC address authentication. Block prohibited websites and services, and create Internet access schedule. Create advanced port forwarding/port triggering, and application forwarding. Configure IP address assignment and DHCP address range. Configure dynamic DSN, secondary port settings, and remote users. Configure remote management access port assignments including acquiring dynamic DNS name. Install and configure wireless Game Adapter (GA) and test it with your Xbox, PSIII, or WII game console. 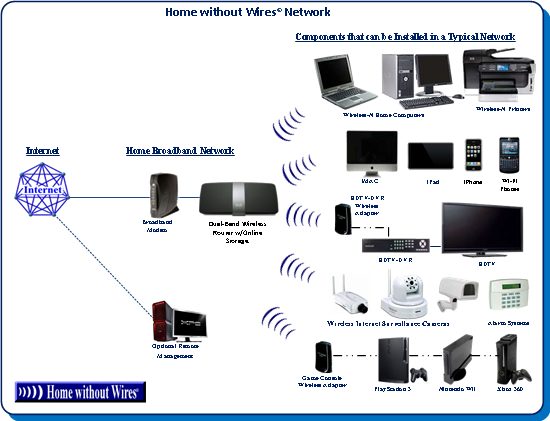 Configure new or existing wireless Internet surveillance cameras to work with your new Home Without Wires© network. If new your Home without Wires© Wi-Fi networking infrastructure does not perform up to your expectation during the first thirty days after it is in place, we will refund your money, and restore your home network back to its original state. Please call us at (602) 478-4778 or (623) 979-1827 for more information or a free, no-obligation quote.